Pine Cone Fire Starters, personalized for weddings, bridal showers, holiday parties, and more. Light the wick and release the natural scent of pine throughout the room. A generous size gift or party favor to thank friends and family for attending your party, celebration, or special event. 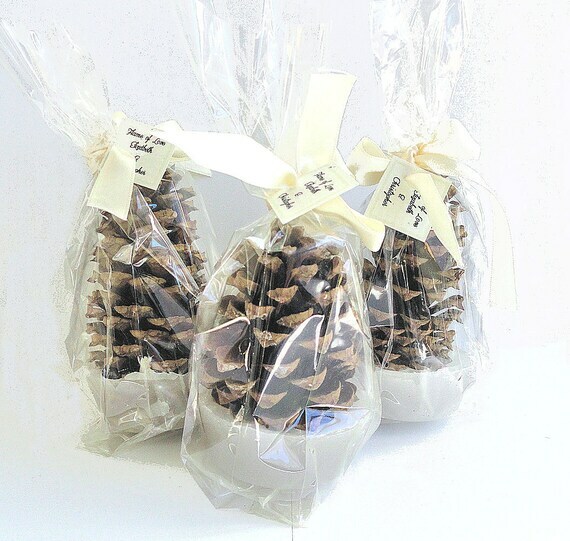 (25) pine cone fire starters, individually gift wrapped in clear favor bags, tied with the ribbon color of your choice and a personalized tag with instructions printed on the back.